Because we manufacture our own precision SMT assembly equipment, DDM Novastar is where you go to get the spare or replacement parts you need for your original equipment. 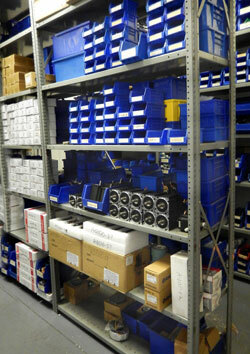 We have a spare parts inventory that includes every machine built since our start in 1983. No other SMT machine provider in the U.S. can boast these capabilities. If you have a problem with a part, you won't have to wait for a shipment from China, because, if we don't have it in stock, we can make it. Diversified Design and Manufacturing, a privately held company specializing in design and development of custom automation machinery and equipment, purchased the assets of APS Novastar in 2011, after they closed down. Diversified's nickname, DDM, became the cornerstone for the new company name - DDM Novastar. With its extensive knowledge of hydraulics, pneumatics, motion control, servo systems, machine vision systems, PLC and PC integration, Diversified Design and Manufacturing is the perfect complement to the skills of DDM Novastar. At DDM, we want you to be completely satisfied with your purchase, and to understand how to operate and care for your machine. We provide a total solution, including training on processes, materials, equipment and implementation, so our customers can focus on getting the job done.